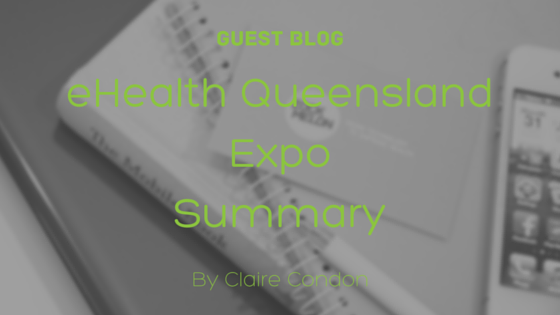 The first Queensland Health eHealth expo (held on 2nd June 2016) brought together a range of people working in the health and technology sectors to “foster collaboration, promote industry engagement and discuss opportunities & challenges in digital health”. The expo was put together by eHealth Queensland and emceed by futurist Chris Riddell who spoke about the increased velocity of change we are currently experiencing. We are now seeing technologies and innovations that would not have been thought possible only a decade ago, and the speed of change & technological innovations is only going to increase. We are now seeing technologies and innovations that would not have been thought possible only a decade ago, and the speed of change & technological innovations is only going to increase. The first section of the day looked at innovations happening in the hospital sector. The Princess Alexandra and Cairns Hospital have been part of the development of moving to Integrated electronic Medical Records (ieMR). The ieMR makes it easier for clinicians to access a patient’s record as all their information and test results are in one location. So in the future if a person moves towns their clinician will be able to bring up their medical record, without having to get it transferred, information will stored together to give a more complete medical history, saving time and allowing for more accurate diagnoses. The Cairns Hospital maternity ward recently had its first “digital baby” where their medical records were electronic only. And just think what the world will be like when this baby grows up, maybe everyone will be getting around in driverless cars without needing a drivers licence. Telehealth was also discussed and is been used in a number of health and hospital settings around the state. It allows patients to receive treatments closer to home, with improved health outcomes for patients and cost savings for the health service & patient. One example of this was the use of telehealth to supervise rural staff in undertaking Cardiac Stress Tests with patients. A specialist was able to watch the staff member as well as viewing the patient’s ECG results in real time, allowing them to give feedback and advice to the staff member as they were performing the test. A different form of communication presented on at the expo was use of Eye-gaze technology at the Lady Cilento Children’s Hospital which is been used as a way to let patients who are unable to communicate through normal speech, to voice what is happening with them, if they are in pain and if they need assistance. The expo finished with a panel discussion with Steve Baxter (from TV show Shark Tank), Jordan Duffy (serial entrepreneur) and Cathy Ford (A/Chief Digital Strategy Officer eHealth Queensland). One of the main messages that I took from the panel discussion is that companies/organisations need to keep trying out different ideas as you will often go through numerous ones before hitting on a couple that actually work out, but you need to be willing to take those risks to get the benefits. Companies/organisations need to keep trying out different ideas as you will often go through numerous ones before hitting on a couple that actually work out, but you need to be willing to take those risks to get the benefits. Data will also play an important part in how we and develop technologies. This is already happening with many people wearing fitness devises, such as Fitbits & Apple watches. Data from these devices is been used in a number of difference ways from tracking people’s heart rates, what they are eating and insurance companies offering discounts on their premiums for people that are more active. But this is only the start, with the mapping of the human genome and lowering of the cost of DNA testing, people are now able to see their ancestral DNA (see SBS’s recent show DNA Nation) and their chance of developing disease in the future. But as the saying goes too much knowledge is not always a good thing, how we, companies & government departments use this knowledge and ensure people’s privacy will be important. With the popularity of this year’s inaugural eHealth expo there was talk about hosting it into the future, so keep an eye out for future expos.